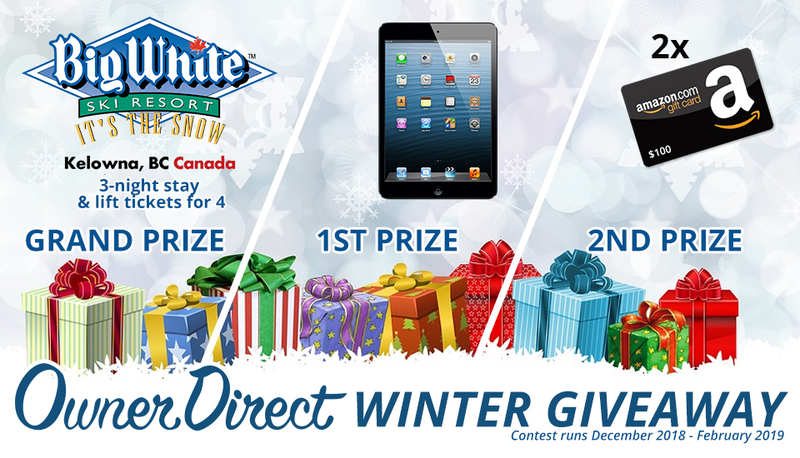 Owner Direct Vacation Rentals is giving away 2 $100 Amazon gift cards, a 128GB Apple iPad mini 4 and a 3 night vacation rental stay at Big White Ski Resort with lift tickets for 4 people! To enter, fill out our contest form here or on our Facebook page. Contest begins at noon PST on Dec 1, 2018. All entrants must have an active Facebook account. All Guests who complete a booking between Dec 1, 2018 and Feb 28, 2019 are automatically entered to win. Any guest who completes a property review after their stay is also automatically entered to win. Owner Direct Rentals (the sponsor) and its agencies will not be responsible for or have any liability resulting from entries which are mutilated, delayed, lost, stolen or misdirected. While online access and a Facebook account may be used to enter the contest, many public libraries, retail businesses and others offer free access to computers and a number of Internet service providers and other companies offer free e-mail accounts. The prizes are : (1) GRAND PRIZE: Up to $1000 towards any OwnerDirect vacation rental stay at Big White Ski Resort for 4 occupants to be used between March 1, 2019 to April 30, 2019 only. This stay also includes 3 days of lift tickets for all 4 people during the stay. Please note this prize does not include ground or air transportation and is non-transferable. Should actual value of Grand Prize be less than stated Approximate Retail Value, winner will not receive the difference in cash or otherwise. ; (1) 128 GB Apple iPad Mini 4 and (2) $100 gift card to Amazon.ca or Amazon.com depending on where the winner is located. If the winner is located in Canada the gift card will be $100 CAD to Amazon.ca. If the winner is located in the USA, the gift card will be $100 USD to Amazon.com. All prizes have no cash value and must be accepted as offered and cannot be exchanged. The prizes will be sent to the winners via recorded delivery and signed receipt will be required. All decisions of the judging organization regarding this contest are final. This promotion is in no way sponsored, endorsed, or administered by, or associated with, Facebook. You understand that you are providing your information to Owner Direct Rentals and not to Facebook. Contest will run during the months of December 2018, January and February 2019. On Jan 1, 2019 there will be a random draw for the 2 $100 Amazon Gift Card winners. On Feb 1, 2019, there will be a random draw for the iPad Mini and on Mar 1, 2019 there will be a random draw for the grand prize at Big White winner. All filled out form entries, completed booking guests and completed property review entrants at that time will be entered into the draws. Winners will be notified by email within 24 hours of the draw. Limit of one email address per person per entry. Each entrant will get an extra entry for each friend they refer through the app. Chances of winning the prizes will be dependent upon the number of eligible entries received during the contest period. If there is no response from the selected entrant, Owner Direct Rentals reserves the right to re-distribute the prize to the next selected entrant. By entering the contest, all entrants agree to be bound by the rules of the contest. All decisions of Owner Direct Rentals (the sponsor) with respect to all aspects of this contest are final. All permanent legal residents of Canada & the USA are eligible to win, providing they are over the age of majority on November 30, 2018, and providing that they are not also employees of Owner Direct Rentals or family members with whom these employees are domiciled. Participants must have an active Facebook account to enter or have booked a stay with Owner Direct Rentals. Owner Direct Rentals (the sponsor) reserves the right to substitute another prize of equal or greater value if the current prize offered becomes unavailable for any reason. If for any reason in the opinion of Owner Direct Rentals (the sponsor), in its sole discretion, the contest is not capable of running as planned or if the administration, security, fairness, integrity or proper conduct of the contest is corrupted or adversely affected, including by reason of infection by computer virus, bugs, tampering, unauthorized intervention, fraud, technical failures or other causes beyond its control, Owner Direct Rentals (the sponsor) reserves the right to cancel, terminate, modify or suspend the contest including any method of entry. Except where prohibited by law, entry into the contest constitutes permission to use the winner’s name, Facebook name, likeness, persona, hometown, and/or prize information in all media now known or later devised throughout the universe in perpetuity for all purposes Owner Direct deems appropriate – including, without limitation, for promotional and publicity purposes – without further permission or compensation. As a condition of being awarded any prize, except where prohibited by law, winners may (in Owner Direct’s sole discretion) be required to execute a written consent, confirming Owner Direct’s right to use such winner’s name, Facebook name, likeness, persona, hometown, and/or prize information without further permission or compensation. As a condition of being awarded any prize, the winner may (in Owner Direct’s’s sole discretion) be required to execute and deliver to OwnerDirect a signed affidavit of eligibility, acceptance of these official rules, release of liability, and any other legal, regulatory, or tax-related documents required by Owner Direct in its sole discretion. The winners’ names and photo entries may be posted on the OwnerDirect family of websites and shared on social media. A representative from Owner Direct Rentals will email/purchase online prizes to be sent to the winners. Winners of the prizes will be responsible for all applicable taxes, license and registration fees. If the winner is found not to be eligible or not in compliance with these contest rules, it will result in disqualification. By accepting prizes, where permitted by law, winners grant to Owner Direct Rentals, and those acting pursuant to Owner Direct Rentals’s authority (and agree to confirm said grant in writing) the right to use and publish his/her name, portrait, picture, voice and likeness for advertising, trade and promotional purposes without additional consideration, worldwide, and on the World Wide Web, without notification, review or approval. By participating, each participant releases and agrees to hold harmless Owner Direct Rentals from any and all liability for any injury, loss or damage of any kind to person, including death, and property, arising in whole or in part, directly or indirectly, from acceptance, possession, use or misuse of the prize, or participation in any Owner Direct's 2018-19 Giveaway related activity. IN NO EVENT WILL OWNER DIRECT RENTALS INC. OR THEIR RESPECTIVE OFFICERS, DIRECTORS, EMPLOYEES, REPRESENTATIVES AND AGENTS, BE RESPONSIBLE OR LIABLE FOR ANY DAMAGES OR LOSSES OF ANY KIND, INCLUDING DIRECT, INDIRECT, INCIDENTAL, CONSEQUENTIAL OR PUNITIVE DAMAGES ARISING OUT OF ACCESS TO AND USE OF INTERNET SITE WWW.OWNERDIRECT.COM OR THE DOWNLOADING FROM AND/OR PRINTING MATERIAL DOWNLOADED FROM SAID SITE. WITHOUT LIMITING THE FOREGOING, EVERYTHING ON THIS SITE IS PROVIDED “AS IS” WITHOUT WARRANTY OF ANY KIND, EITHER EXPRESSED OR IMPLIED, INCLUDING BUT NOT LIMITED TO, THE IMPLIED WARRANTIES OF MERCHANTABILITY, FITNESS FOR A PARTICULAR PURPOSE OR NON-INFRINGEMENT. SOME JURISDICTIONS MAY NOT ALLOW THE LIMITATIONS OR EXCLUSION OR LIABILITY FOR INCIDENTAL OR CONSEQUENTIAL DAMAGES OR EXCLUSION OF IMPLIED WARRANTIES SO SOME OF THE ABOVE LIMITATIONS OR EXCLUSIONS MAY NOT APPLY TO YOU. CHECK YOUR LOCAL LAWS FOR ANY RESTRICTIONS OR LIMITATIONS REGARDING THESE LIMITATIONS OR EXCLUSIONS. All issues and questions concerning the construction, validity, interpretation and enforceability of these rules of the contest, or the rights and obligations of the entrant and Owner Direct Rentals Inc. in connection with the contest, shall be governed by, and construed in accordance with, the laws of the Province of British Columbia, without regard for conflicts of law doctrine. Owner Direct Rentals (the sponsor) will not be responsible for incorrect information in comments, status updates, telephone, technical, network, online, electronic, computer hardware or software failures of any kind, misdirected, stolen, incomplete, garbled or delayed Internet/e-mail computer transmissions on account of technical problems or traffic congestion on the Internet or at any website, or any combination thereof, including any injury or damage to the participant’s or any other person’s computer relating to or resulting from participants or downloading any materials in this contest. Finally, Owner Direct Rentals (the sponsor) reserves the right to modify contest rules without materially affecting the terms and conditions of the contest. Owner Direct Rentals reserves the right, at its sole discretion, to disqualify any individual who (i) tampers with the entry process or the operation of the contest or website; (ii) acts in violation of the rules of the contest; (iii) acts in violation of the terms of the website, or (iv) acts in any way that discredits or otherwise disrupts Owner Direct's 2018-19 Giveaway or Owner Direct Rentals, Inc, including all of its participating entities. Online entries will be deemed to have been submitted by the authorized account holder of the Facebook account at the time of entry. “Authorized account holder” is defined as the natural person who is assigned to the Facebook account and assigned to the associated e-mail address by an Internet access provider, online service provider or other organization (e.g. business, educational institution, etc.) that is responsible for assigning e-mail addresses for the domain associated with the submitted e-mail address. All entries become the property of Owner Direct Rentals (the sponsor). No correspondence will be entered into with any contestants except with the selected entrants. The contest is subject to all Federal, Provincial, State and Municipal regulations and is void where prohibited by law.